There are a lot of things to consider while making a decision to bring a pet to your home. It is about bringing a new life in your house for which you are fully responsible. You must think twice before bringing a teacup pig in your home. You need to understand about these creatures well and then make the decision to keep them as your pet. Teacup pigs are highly adorable with an intelligent mind. These are like little kids who will demand your attention. They are mischievous, curious, intelligent and manipulative at the same time. Mini pigs are humorous and you’ll love them for their funny acts. Their intelligence level is much more than the dogs and cats. You will find them very interesting and when thinking about training them, it will be a fun activity. They learn the things very soon and respond to your talks in the best way. Teacup pigs are best for allergic people. Due to no fur coating on the body, they don’t shed like dogs and cats. They have simple hair on the body and this is the reason that they are non-allergenic pets. There are least chances of fleas attracted by the body. You can litter train them easily and do fun tricks as you anticipate from the other pets. 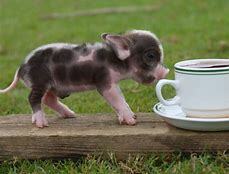 Teacup pigs can bond with human beings and other pets very well. They will snuggle with you and don’t produce barking sounds. There are no chances of infections and viruses for teacup pigs as it is with the dogs or cats. You can train them by motivating them and giving them food as little gifts for their good deeds. Taking them for walks will keep them fit. There are many accessories available for teacup pigs online as well as in the market shops. You can get such things to make them look attractive. Teacup pigs are very special animals and can bond with the owners in the best way. You can give a small area to them for their bedding as these animals love to have their personal little comfort space. You can check online for the happy pig owners and the way they share their experiences in terms of keeping these small pets in their home. They are very cute creatures with sharp minds and you can mold them in your own way to make them a part of your family. Pigs love to snuggle and cuddle. Be ready to give them ample of hugs and all your love for making them happy from inside. Teacup pigs don’t have sweat glands and hence, they don’t generate any kind of smell. The males are neutered and females are spayed for avoiding the scent glands to develop in their body. Hence, if you keep them in your house, the neutering or spaying activity has to be done for keeping the house and the pet clean. Teacup pigs are very sociable and would mingle well with other pets in the house and the family. If you try to make them adjustable in the younger stage, it will be beneficial for you in the long run. They love to have their personal blanket in all the weathers. The rooting instinct is satisfied for pigs by digging around the blankets and they enjoy their personal space by enjoying in their bed area. Pigs are very smart creatures and learn faster than other pets like cats or dogs. They have different behavior than other pets. The pig can be calm and clean, depending on the training being given to them. Pigs can also get spoiled by over-pampering, overfeed or lack of training. They learn the disciplinary techniques right from the beginning of their lives and whatever you train them remains with them throughout. The psychology of pigs is very simple. Treat them like a little baby and they will respond in a lovable way with you. Whenever you get the pig to your home, the breeder will give you the educational handout about their daily care, training, and other important topics. Pigs are basically fond of spending time in outdoors. It is their natural instinct to root and spend time in mud and water. It can be arranged according to the weather and space availability on the weekends. Teacup pigs love to play in the water and a shallow pool session would really make them happy. The owner must take care of this important thing and check the behavior of their pet on regular basis. The pigs don’t get fleas due to which they don’t cause allergies. If you are getting a pet for your family or you live alone and are prepared to take care of the pet, teacup pig would be a great option for you. It is always advisable to take care of the pig and hence, adopt it only when you are ready for the same. You can check the social rules and legalities of owning a teacup pig in your locality to finalize your decision of getting a teacup pig. These animals might be considered as a livestock and not allowed in your area. To manage the pigs well, they must be neutered or spayed by a professional veterinary doctor. These animals become uncontrollable if not treated well. Pigs have an unregulated urge for eating and are always willing to eat. They can even open the drawers or fridge when hungry. Some people are happy with their piggy pets and others might think it as a hassle. Whatever pet you are planning to bring home, it is essential to make an informed decision about handling the responsibility. It is not a light decision but a wholesome duty of the owner to take care of the pet. Think deeply about the pros and cons of having a teacup pig to make your decision for keeping them as a pet. It is a commitment and must be carefully chosen.